UCI physicists were honored with the announcement that the Super-Kamiokande (Super-K) experiment in Japan and the Sudbury Neutrino Observatory (SNO) experiment in Canada both received the 2015 Nobel Prize in Physics. The prize highlights the role that both experiments played in the discovery that the neutrino, one of the most abundant elementary particles in the Universe, has mass. UCI physicists play a key role in the Super-K experiment. “This year’s Nobel prize in Physics would not have been possible without the UCI contributions of Professor Henry Sobel and his team, including Bill Kropp, Michael Smy, Shunichi Mine, Jeff Griskevich and Mark Vagins,” says Kenneth Janda, Dean of the UCI School of Physical Sciences. Professor Sobel is co-spokesperson for the Super-K and his research group handles part of the detector’s operation and analysis. The SNO experiment was designed and initiated by the late UCI professor Herb Chen. In 1998 the Super-K collaboration announced first evidence of neutrino oscillation. “Neutrinos come in three types, or “flavors” and the observation showed that one type of neutrino changes to another type as they travel through space. This can only happen if the neutrino, which previously was thought to be a massless particle, has mass,” explains Sobel. Neutrino mass is not predicted in the so-called ‘Standard Model’ of particle physics and this observation thus showed that this model is incomplete. After this discovery, neutrino experiments have blossomed around the world in order to understand their more detailed properties. 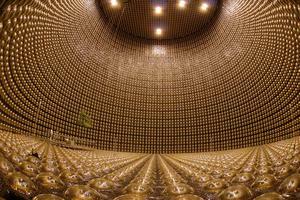 Neutrinos were discovered by UCI’s Frederick Reines, who won the 1995 Nobel Prize for his work. The U.S. participation in the Super-Kamiokande Collaboration includes following institutions: Boston University, University of California-Irvine, Duke University, University of Hawaii, Stony Brook University, California State University - Dominquez Hills and previously the University of Washington, LSU and the University of Maryland. The U.S. groups gratefully acknowledge the U.S. Department of Energy, Office of Science support of Super-Kamiokande, dating from 1991 to the present.